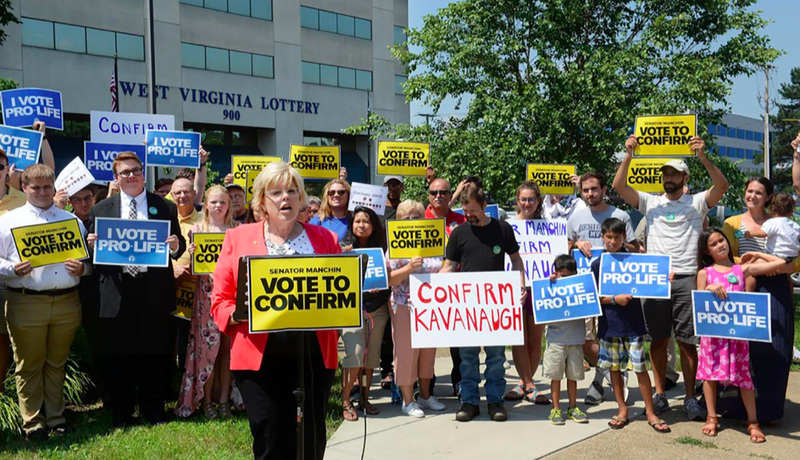 Jill Stanek, national campaign chairwoman for the Susan B. Anthony List, speaks to anti-abortion demonstrators rallying Tuesday outside Sen. Joe Manchin’s Charleston office in support of Brett Kavanaugh, President Donald Trump’s nominee for U.S. Supreme Court justice. CHARLESTON, W.Va. — Sen. Shelley Moore Capito, R-W.Va., and the Republican campaigning to serve alongside her each signaled Tuesday their support for President Donald Trump’s second nominee to the U.S. Supreme Court. Meanwhile, Sen. Joe Manchin, D-W.Va., who is running for re-election in November against state Attorney General Patrick Morrisey, did not indicate one way or another in a statement released Monday evening. Instead, he said he would evaluate Judge Brett Kavanaugh’s record, while also invoking current Justice Neil Gorsuch and President Barack Obama’s nominee, Merrick Garland. “Just as I did when Merrick Garland and Neil Gorsuch were nominated, I will evaluate Judge Kavanaugh’s record, legal qualifications, judicial philosophy and particularly, his views on health care,” he said.